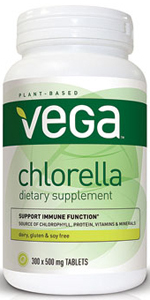 When I am asked what I recommend for a multi-vitamin/mineral product...I recommend VEGA Chlorella. Contains close to 600 different nutrients... vitamins, minerals, amino acids, essential fatty acids, enzymes, antioxidants, etc. Highly alkaline to promote healthy pH. Provides energy for all systems of the body! Supports immune system (also anti-cancer) and protects tissue from radiation or chemotherapy damage. Boasting the highest concentration of chlorophyll of any known plant (3 times more per serving than spinach), chlorella has earned its reputation as the ultimate green superfood supplement. Highest natural source of Chlorophyll, RNA and DNA to aid in detoxification & healing. Helps maintain proper pH in body, support health of bones and teeth, blood pressure and much more!